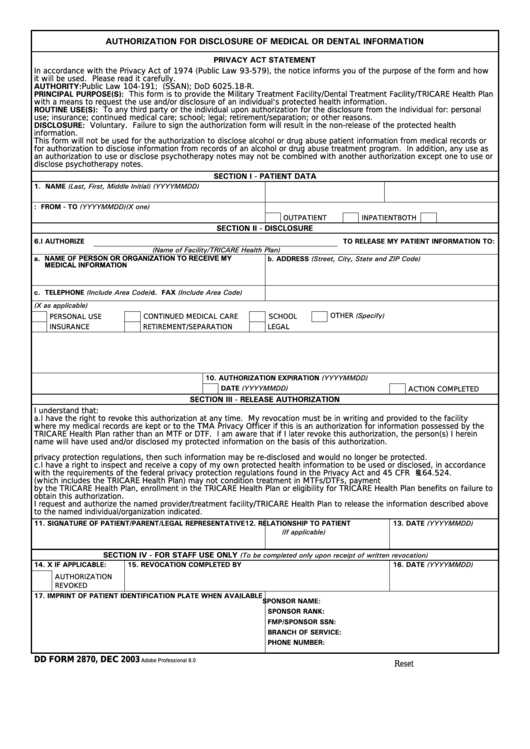 Download a blank fillable Dd Form 2870 - Authorization For Disclosure Of Medical Or Dental Information in PDF format just by clicking the "DOWNLOAD PDF" button. Complete Dd Form 2870 - Authorization For Disclosure Of Medical Or Dental Information with your personal data - all interactive fields are highlighted in places where you should type, access drop-down lists or select multiple-choice options. it will be used. Please read it carefully. AUTHORITY: Public Law 104-191; E.O. 9397 (SSAN); DoD 6025.18-R.
with a means to request the use and/or disclosure of an individual's protected health information. use; insurance; continued medical care; school; legal; retirement/separation; or other reasons. name will have used and/or disclosed my protected information on the basis of this authorization. privacy protection regulations, then such information may be re-disclosed and would no longer be protected. with the requirements of the federal privacy protection regulations found in the Privacy Act and 45 CFR 164.524.
to the named individual/organization indicated.